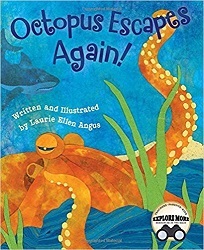 ﻿ Sonderbooks Review of Octopus Escapes Again! Review posted July 17, 2018. Dawn Publications, 2016. 32 pages. This beginning science book is so simple, our library system is shelving it with picture books – but it’s also full of facts. Facts about the common octopus are indeed presented as a story – the story of an octopus spending her day looking for food – and meanwhile escaping the predators who want to eat her. Along the way, we learn what sort of creatures an octopus likes to eat, but especially the clever ways an octopus escapes being eaten. The illustrations are gorgeous, and with a wide amount of variety. Done with cut paper, there’s a nice realistic effect. I already knew that an octopus is clever. This one escapes by squeezing into an empty shell, by using its ink to confuse an attacker, by speeding away with a blast of water through its siphon, by releasing an arm, and by quickly changing color to camouflage itself. The story is simple enough to read to preschoolers, but there is a paragraph of facts about each escape technique. At the end of the book there are five pages of back matter, complete with ideas for enrichment activities. A fantastic choice for beginning science lessons.